Ice Cream to Help Lower Stress? Try Some Avocado Ice Cream – WellPsyche. Beyond. Stressful day left you wanting a pint of chunky monkey? 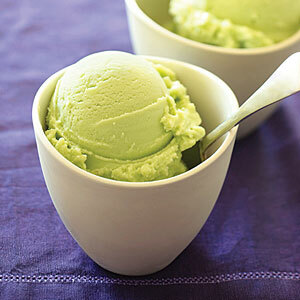 Try this delicious avocado ice cream to satisfy your craving and give you a healthy dose of stress-fighting vitamin B. Low vitamin B levels are linked to increased risks for depression, memory problems and paranoia (think: extreme anxiety). Avocados are high in vitamin B as well as potassium and healthy fats, which are both known to lower blood pressure. So next time you’re feeling overwhelmed, try whipping up a batch of this good-for-you-green ice cream that you can enjoys, sans the guilt. Place the can of coconut milk in the fridge overnight. Cut the avocados in half, remove the pit and spoon out the avocado flesh. Put the avocado flesh in a food processor together with the lemon juice and blend until smooth. Open the coconut milk can upside down and spoon out the coconut cream until you hit the coconut water. Whip the coconut cream in a bowl with an electric mixer until it looks like whipped cream. Add in the avocado cream and the rice syrup and mix until fully incorporated.